Jimmy Dean tries for a breakfast mash up with the launch of new Stuffed Hash Browns featuring crisp-fried, diced potatoes stuffed with meat and cheese. - Sausage and Cheese - Filled with sausage, mozzarella, and cheddar. - Meat Lovers - Filled with sausage, bacon, ham, cheddar, and mozzarella. - Bacon & Veggies - Filled with bacon, tomatoes, peppers, onions, cheddar, and mozzarella. For microwave cooking, each Stuffed Hash Brown comes with a crisping sleeve, which should result in a crispier end product than if you were to just cook it on a plate. 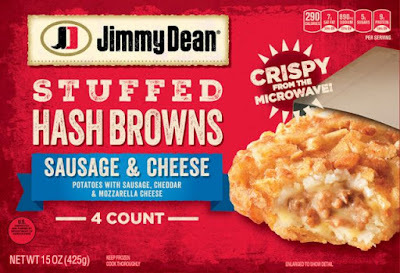 Jimmy Dean Stuffed Hash Browns can be found in the frozen food section of grocery retailers nationwide. They come in four-count box with a suggested price of $5.49 per box.